Substance use and in particular, opioid misuse, have been identified as significant public health concerns. Accidental deaths involving opioids have quadrupled since 1999, making drug overdose the leading cause of unintentional death in the United States. Over the last 15 years the rate of deaths from drug overdose in Colorado have frequently been higher than the national rate. Overdoses related to prescription opioids have quadrupled since 2000. Between 2010 and 2016 in Boulder County, there was an 800% increase in the number of individuals accessing safe injection supplies from the Boulder County Public Health Works syringe access program. 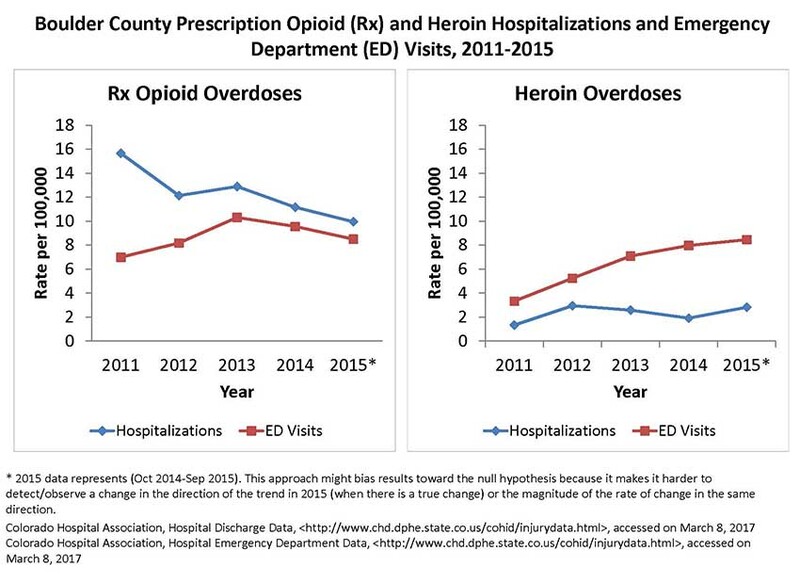 While fatalities, emergency room visits, and hospitalizations from prescription opioids decreased between 2011 and 2015 in Boulder County, emergency room visits involving heroin increased. In 2016, the heroin overdose rate increased to 4.7 per 100,000. States across the country have implemented Prescription Drug Monitoring Programs (PDMPs). The goal of the PDMP is to provide prescribers and pharmacists with patient information to ensure prescribing and dispensing practices are appropriate. Data from 2014-2016 suggests that prescribing practices are improving in Boulder County and Colorado. However, in 2016, a higher proportion of Boulder County residents received high dose prescriptions. Approximately one in ten individuals in Boulder County with an opioid prescription also had an overlapping benzodiazepine prescription, placing them at increased risk for overdose. **Patients who have not had an opioid prescription in the past 60 days. Fortunately, the rate of multiple provider episodes (doctor shopping) is lower in Boulder County than elsewhere in the state (11 per 100,000 in Boulder County versus 32 per 100,000 in Colorado). However, as high dose opioids become less frequently prescribed, data suggests that there is often an associated increase in heroin use. According to a Denver Metro study of 504 methadone clients, 70% said that prescription pain killers played a role in their decision to start using heroin. The Colorado Consortium for Prescription Drug Abuse & Prevention is working to standardize regulations and guidance, but variations do still exist. For example, the Colorado Quad-Regulator Boards of Dental, Medical, Nursing, and Pharmacy currently recommends limiting opioid dosages to less than 120 mg morphine equivalents (MME) per day to reduce negative outcomes while the Centers for Disease Control and Prevention (CDC) prescribing guidelines recommend opioid dosages be reduced to 90 MME per day. One strategy for preventing the transition from prescription opioids to heroin is to develop tapering schedules with clients. Medication assisted treatment, including methadone, buprenorphine, and naltrexone are available for individuals with an opioid use disorder. Several new medication assisted treatment providers are now offering services in Boulder County.